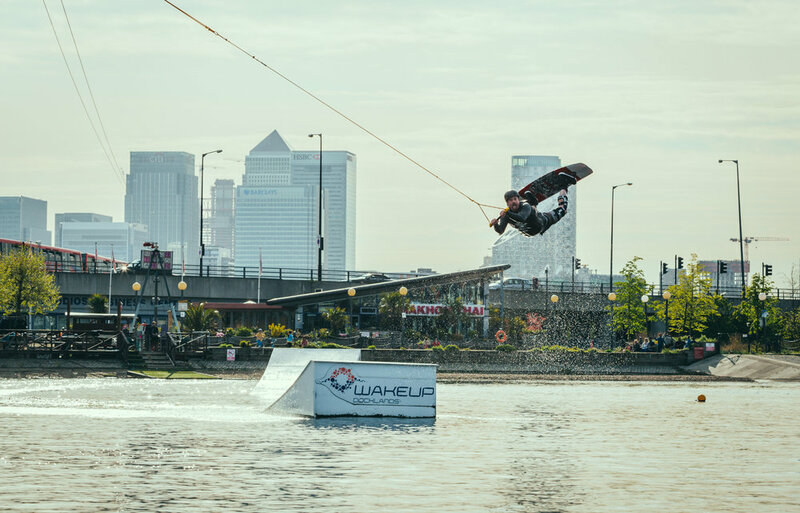 Unique to London, WakeUp Docklands is London’s only cable wake park within the central transport network and offers a variety of water sports in an inner city environment. 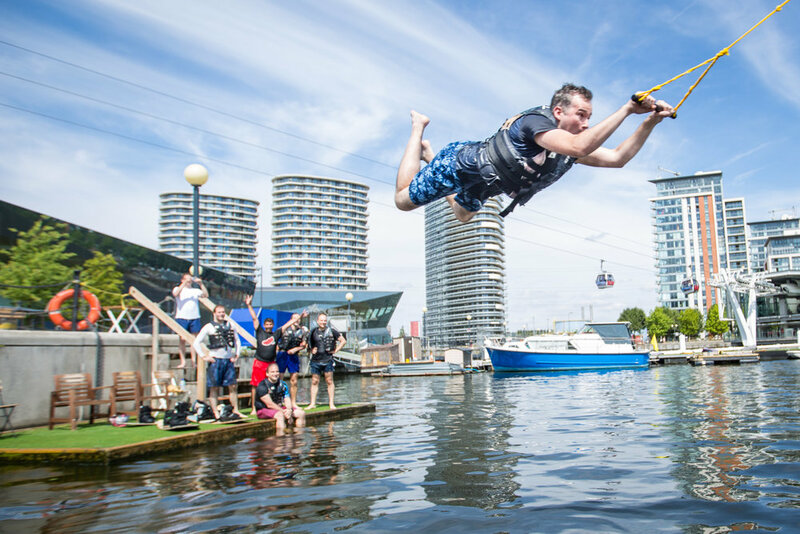 Specialising in cable wakeboarding, stand up paddleboarding (SUP) and SUP yoga we are based on the sheltered waters of Royal Victoria Dock and our site boasts visually stunning surroundings with fantastic public transport links in one of London's most exciting and up-and-coming areas. Now its 7th season, WakeUP Docklands is operated by a 100% rider owned and rider driven company: Riderr Ltd. Jon and The Team are always eager to help, whatever your enquiry, so if you're wondering what session is right for you to book, learn some new tricks, or just want to chew the fat over the latest goings on, you'll find everyone at the park ready and willing to help! Royal Victoria Beach, London E16 1AG. Nearest station: Royal Victoria Get me there - citymapper. Please use our online booking system to pay for and reserve wakeboarding sessions: Top tip: why not check out our bulk buy punch card deals. They can be shared with friends and make riding cheaper than individual bookings. If you are new to watersports, do not be concerned. 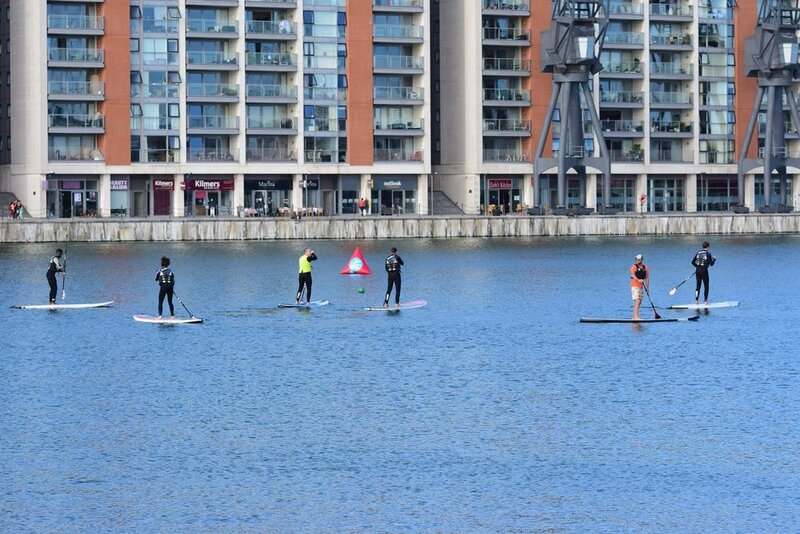 WakeupDocklands is host to an array of activities to suit everyones’ tastes and abilities, including beginners. Our dedicated team of knowledgable instructors will ensure you quickly feel like a seasoned local, cruising up and down the dock in the sunshine. At the end of a regular beginner session almost all people are able to stand up and enjoy their 1st tentative rides, some even manage to look like they've been doing it for a while! Wakeupdocklands uses the world's best-selling two-tower cable system developed by Sesitec. With cable speed being controlled by an experienced operator and wakeboard instructor, this System 2.0 technology takes riders up and down in a straight line, making it very easy to learn wakeboarding. The hight of the cable combined with precisely adjustable speeds bring beginners efficiently up to their feet in a safe and controlled manner. System 2.0 also helps advanced riders quickly master new tricks out of the water and on the rails and kickers. We have recently upgraded all the running cables in the wakepark and even added shiny new direct drive engine to our Gold Cable for stronger pull and bigger air tricks. You’ll also be able to kick back and enjoy the action from our fully licensed beach bar! Please note: sessions start on the hour every hour, so please arrive at least 20 minutes before the start of your session to get ready to be on the water at the start of the hour. Follow the link below to access our full FAQ’s! All punch cards tokens can be shared with friends and come with free equipment hire! New for the 2019 season, we are pleased to be able to offer introductory hydrofoiling lessons on our "Blue cable". Designed to help you find your first step towards hydrofoiling, these lessons are especially great if you are a keen kiteboarder, wishing to get the feeling of hydrofoiling before introducing your kite and wind into the mix! Lessons are by 'appointment only' so please enquire using the contact us form on the bottom of the website as we need to factor you in around our exsisting wakeboard sessions. 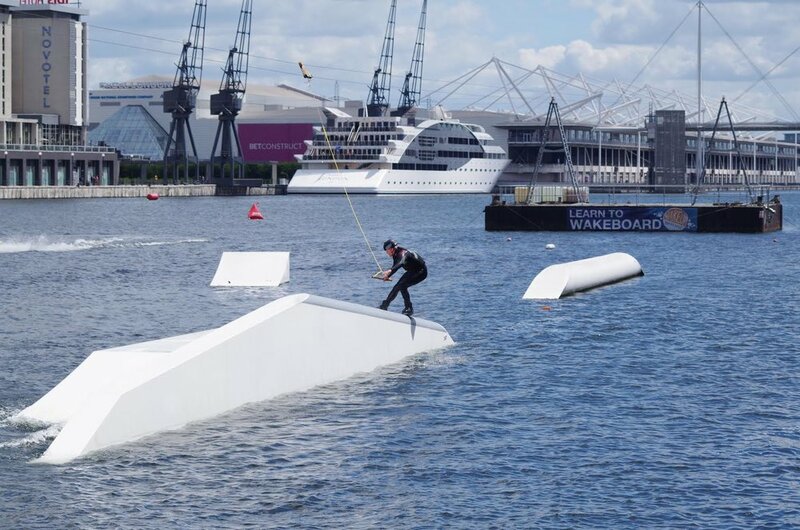 Please note: Hydrofoil lessons are only suitable for expereienced wakeboarders & kiteboarders looking to take the next step and learn a how ride a hydrofoil. We do not give coaching on the use of kites and it is forbidden to operate kites in our waters so please leave them at home. WakeUp Docklands is a superb venue to host all sorts of gatherings. Whether you're looking for a day out of the office, a team building exercise, a birthday party or a stag/hen doo, we are here to help. We can accomodate groups of a range of sizes and have catering options available if required. Contact us via phone or email (bookings@wakeupdocklands.com) to find out more. 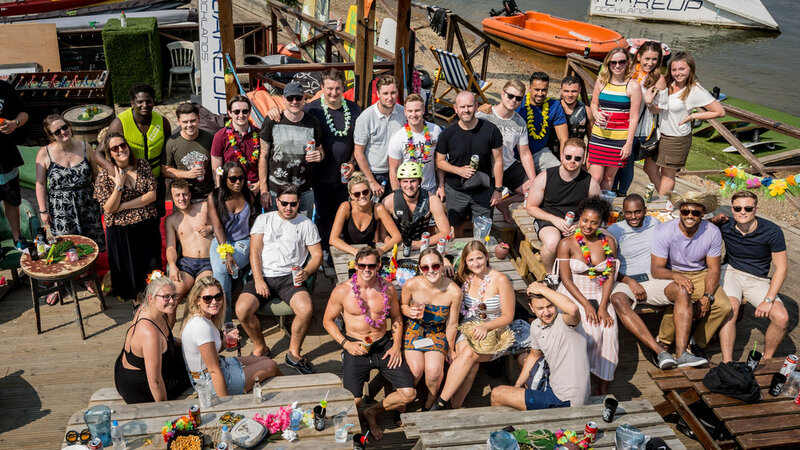 Nestled in the SW corner of the Royal Victoria Dock you'll find Byrney's Beach Bar. A Hawaiian themed, grass roof hangout, right on the waterfront. There's no better place to kick back, meet like minded people and grab a drink from the licensed bar. Quite simply, it's where all the fun is once you've finished your set and are off the water. Caribbean Seafood Friday’s are always a hit! How many lessons does it take to learn to wakeboard /paddleboard ? Thats a difficult question to answer as everyone learns at different speeds however both sports have very progressive learning curves hence and in general our customers take to both quite easily on their first session. We teach people of all ages and experience and believe to offer a high level of customer satisfaction. You will be guided safely every step of the way. What do I need to bring to the lesson and whats included? Just something to wear under your wetsuit, swim trunks or bikini and a towel. We can provide all the additional gear if you need to rent it. Otherwise, if you have your own equipment, you arer welcome to bring it. Do you offer coaching? Yes. All our lessons include coaching from one of our coaches. View our full FAQs here. The best way to contact us is via the enquiry form (right) as we are often out on the water and not in the office.